This summer has been brilliant. I’ve seen one daughter get married in Italy, another daughter find health and happiness with a new partner, I’ve travelled a lot, had some excellent holidays and enjoyed some memorable summer picnics with friends with our respective little grandchildren in tow. A chat with a very good friend of mine, Janet, made me stop and think about life, love and what we leave behind us as a legacy to our younger generations. Happy memories and family values, hopefully. But in tangible terms, something creative and personal. 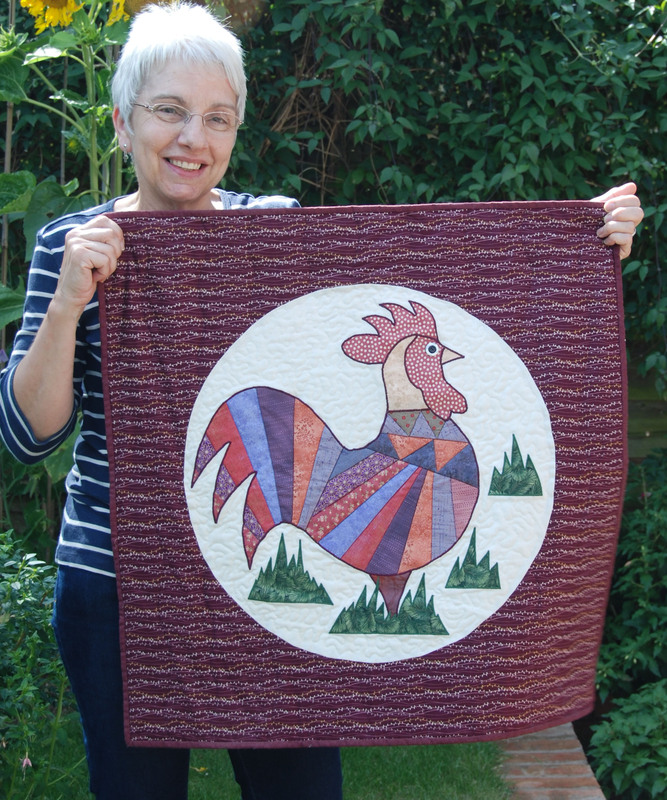 When did you start quilting?When I retired, about 5 years ago. I had resisted for years because I didn’t have enough time to spend on the craft and I thought I would have time on my hands after I retired. Big mistake. Why do you like doing it? I tried many crafts over the years (bobbin lacemaking, tatting and embroidery to name but three) but I find that patchwork and quilting produces articles that almost everyone would like to own so I no longer produce items that are admired but not wanted or used. On the negative side, the materials are quite expensive and it takes a fair amount of room to execute. Who do you make quilts for? Family, mostly. 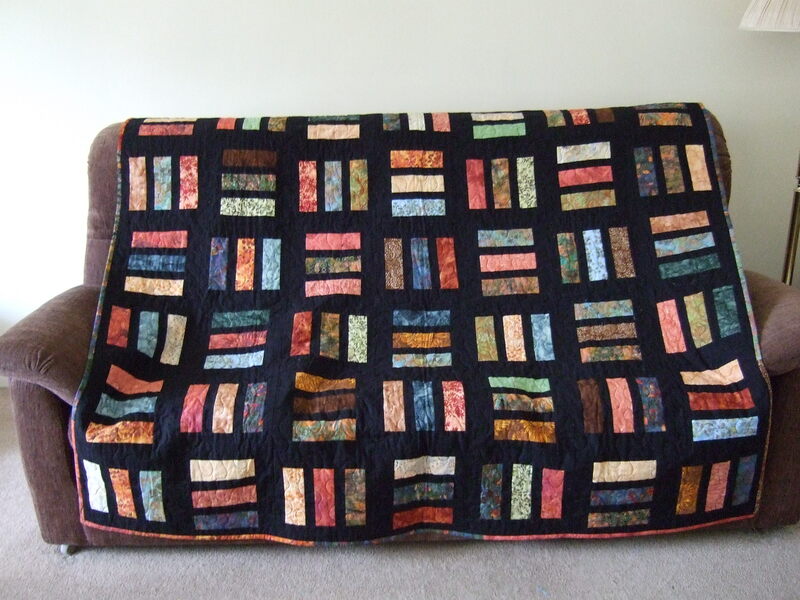 Quilts make lovely presents for special birthdays and anniversaries. Also, they come in all shapes and sizes so you can make a tiny buggy quilt for a neighbour’s new baby, which would be thoughtful but not embarrassingly extravagant. At the other extreme you could make a bed quilt for a son or daughter’s wedding present. Where do you get your fabrics from? My favourite, fairly local, shop is Bramble Patch in Weedon, which has a vast range of delicious fabrics and where there are always numerous quilts on display providing inspiration. I also go to a few quilt fairs during the year, most notably The Festival of Quilts at the NEC in August. How do you choose styles and colours? Styles are quite easy as there are numerous books and magazines available. Colours are much more difficult and choice is crucial to the success or failure of the finished article. I am not very good at choosing colours . . .
How long does it take to complete a quilt? It depends on the size of the quilt, complexity of the pattern, whether it is hand or machine quilted and how much time you have available to devote to it. I have never totted up the time taken to make an item but I would guess that a simple lap quilt could not be worked in less than 25 – 30 hours. This is why I think quilts make fabulous presents for loved ones – anyone can go into a shop and buy a present. Mind you, only those who do hand crafting themselves can have any idea of the time involved. Do you do it all by hand or do you use a sewing machine? Mostly by machine but sometimes I use both techniques. 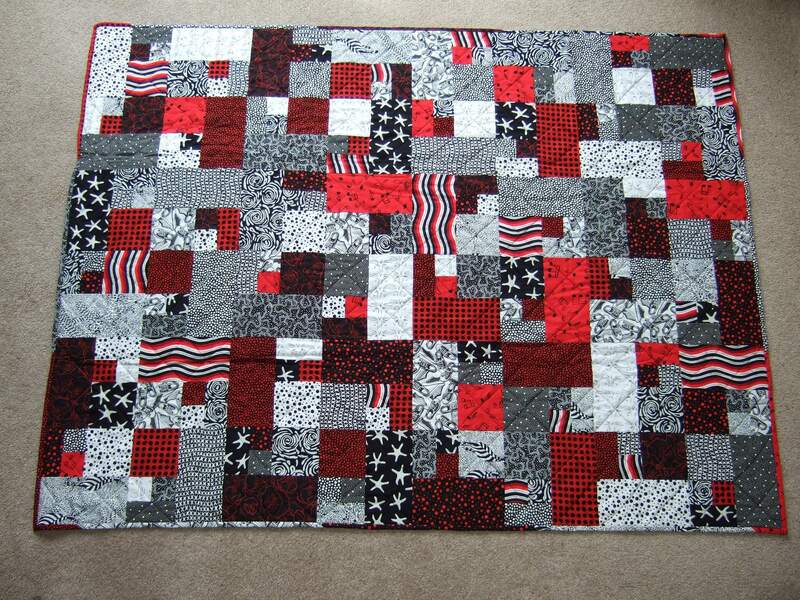 Only once have a made a quilt entirely by hand and this was for a competition that stipulated it. I did not win. Do you have a favourite creation? No, but baby quilts always have the Ahhh factor. 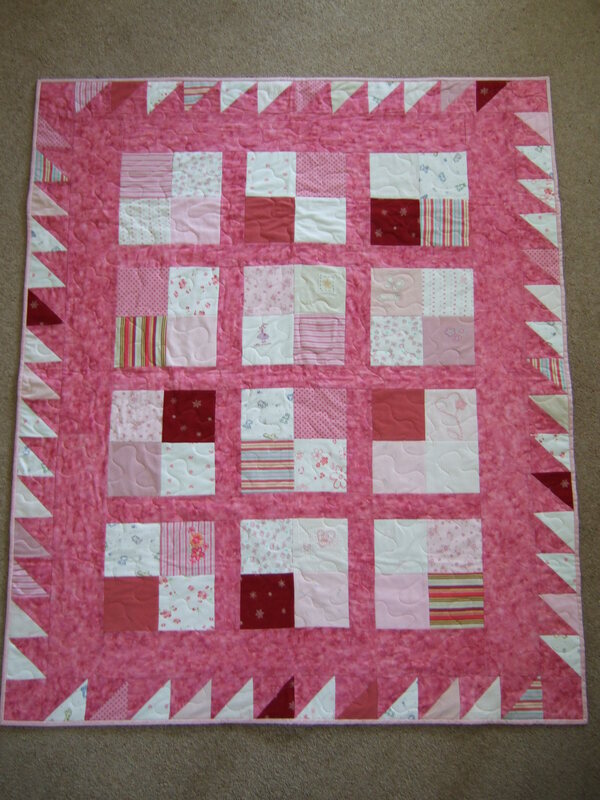 I recently made a quilt out of my granddaughter’s old Babygros , which I thought was a nice memento. How many quilts have you made? About 25. I’m really envious of my friend’s achievements – those quilts will be treasured for years to come by her family not just for their beauty but for the love, care and time taken in their creation. To be given something, to own something that has been made specially for us is an emotive link to the past, and a wonderful and comforting way of remembering someone we love when they are no longer around. Although I used to enjoy sewing and made quite a few of my daughters’ clothes when they were little, quilting is probably not something I would be very good at, I’m a bit too slapdash, too impatient. But as writing is my main form of creativity these days, Janet’s quilting ‘labour of love’ has made me think about writing something especially for my 3 yr old granddaughter, and for any other grandchildren who may come along in the future. Quite a challenge, as I know only too well that writing for children is much harder than writing for adults. But I’m going to give it a go – my new winter project! Rosalie Ash is a member of the Society of Authors and the Romantic Novelists Association. Between 1989 and 1999 she wrote 21 successful contemporary romance novels, published by Harlequin Mills & Boon. She then decided to drag herself out of her romantic bubble into the world of work. Now, over a decade on, she has started writing romantic fiction again, as well her latest passion, children's picture books for age 3-5, and she is now a member of SCBWI-UK (Society of Children's Book Writers and Illustrators, UK). This entry was posted in Uncategorized and tagged Arts, children's books, Crafts, families, grandchildren, legacies, new autumn projects, Patchwork quilt, Quilt, quilting, special memories. Bookmark the permalink. 2 Responses to Love and Quilting! Sounds a great new winter project! If you need any illustrations? ….. The 4 Ways to Show Your Love for MISTER ORANGE! Naughty but Nice. Look what we cooked for our Valentine’s meal! MISTER ORANGE: Not bothered by his new-found fame..
Who is MISTER ORANGE? Free download! “A WILD INHERITANCE” now out on Amazon! writing and doodling about things I like. Trying new things, living out loud and being amazing! Maximize The Enjoyment of Your Kindle!